Celebrate your special occasion with these exquisite 15 ounce stemless wine glasses! 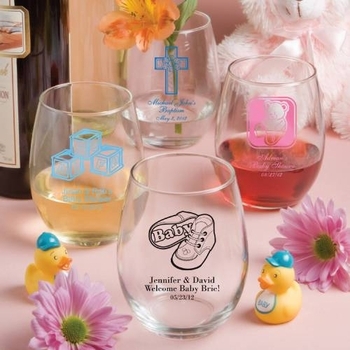 We have many personalization options available to complement various occasions, such as baby showers, weddings and birthdays. Each glass measures 4 1/4 inches tall by 3 1/4 inches in diameter. These 15 ounce glasses are proudly made in the USA. Glasses will arrive bulk packed. Bring your ideas to life and personalize these from a wide range of colors, graphic designs and titles to compliment the theme of your party. Gift boxes are also available for $.65 each. Click the More Images tab above to see photos of the optional gift box. Processing Time 10 Business Days. Does not include shipping time.